Hat tip to "Radiation News" for making us aware of the Taos reading. The preliminary information was sourced from the "radiation network"
The report is short on exact details, however the available information indicates that the approximately 3x background reading was taken in calm, windless air, with no rain or snow present. The event lasted approximately 20 minutes before taking a step-function like drop. The report WRONGLY indicates that Jet Stream "flow too far north to be a factor". 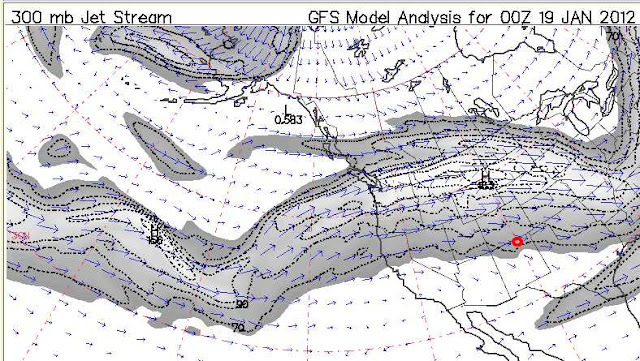 A quick look at the Jet-Stream map shown below indicates the Jet Stream was likely a primary factor in the reading. The area of detection is circled in red, the time stamp on the map corresponds approximately 48 minutes before the reading was taken. Good post and video above.